Citronella Essential Oil repels insects such as mosquitoes, flies, ticks, therefore preventing its bite. When citronella oil is diluted properly in base oil and is applied to skin, it produces a mild sensation of warmth- which relieves painful muscles and joints. It can also be used as a pet bedding freshener. Khadi Pure Gramodyog™ Herbal Citronella Essential Oil is cold pressed from plants grown in the..
Nirvana CITRONELLA Essential Oil 10 mlCitronella Essential Oil is produced by steam distill..
Indus Valley essential oil is derived from Cymbopogon Nardus plant. 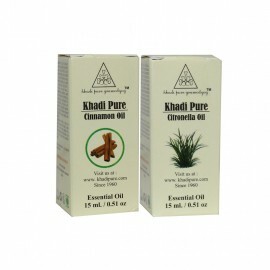 It has various uses and is famou..
1 Pcs - Khadi Pure Herbal Cinnamon Essential Oil - 15ml, 1 Pcs - Khadi Pure Herbal Citronella Essent..
Citronella essential oil is one of the most common oils used in aromatherapy. Commonly used to .. Ancient Living Set of 6 Essential Oils (10 ml each)The Ancient Living 6 Set Gift Pack comprises .. Ancient Living Set of 12 Essential Oils (10 ml each)The Ancient Living 12 Set Gift Pack com..